The development of teeth in humans is fascinating. Each of the 32 adult teeth has a specific role to play in the chewing and consumption of food, in speaking clearly, and in supporting the jaw, gum, and facial structure. Yet while most people have 32 teeth — 16 on top and 16 on the bottom — there are only four different types of teeth: Incisors, Canines, Premolars, and Molars. To understand how teeth work, it’s important to know how food is consumed. The average adult eats many different types of food, including everything from soft foods that require no chewing like oatmeal and puddings to tougher foods that require a lot of chewing like meats, nuts, fruits, and vegetables. The first teeth most foods encounter are the incisors. There are eight, all located in the front of the mouth. Four sharp teeth on top and four on the bottom are used to bite and cut foods so the pieces are small enough to chew. 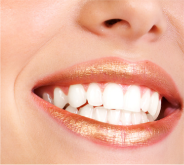 The incisors also help you pronounce words as well as support the lips from the inside. The canines are the next set of teeth. There is one canine each located on each side of the upper and lower incisors. These are these are the sharp, pointed teeth that are also known as cuspids. Like the incisors, the canines also help cut and shear off food so that they are more manageable for chewing. The canines also are important because they help guide all the other teeth, keeping them in line so when the upper and lower jawline comes together. Behind the canines are the premolars. These flat teeth are used to chew pieces of food so they can be broken down more easily for swallowing. Adults have eight premolars, four on top and four on the bottom. Afte the premolars come the molars. These are larger versions of the premolars and are located in the back of the mouth. As the widest and flattest teeth, the 12 molars chew and break down food. They also help maintain the height of the face. Interestingly, your six lower molars have two roots each while the six upper molars have three each. The incisors, canines, premolars, and molars all play an important role in chewing, speaking, and supporting the gums and facial bones. Keep all your teeth healthy and effective by seeing your dentist at McCosh Family Dentistry regularly.